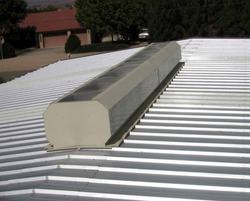 Ridge ventilators used on metal roofing systems conform high standards and specifications which have been developed, tested and proven over many years. They provide an excellent value for the user. Ventilators manufactured by a one industries are in accordance with the highest design requirements and specifications. Being a well known company with the ongoing fashion trends, we have come up with an attractive array of Ridge ventilators. Being the well-distinguished companies in the market, we are into offering Ridge Ventilator. Weathered ventilation working on the principle of “Stack Effect is best suited for most industrial & commercial buildings and can provide both day to day ventilation and smoke extract as well. Additionally, permits the entry of natural daylight too. The Roofmax Ridge Ventilators, Roof Ventilators are designed to operate very effectively and efficiently performance by the movement of fresh air all through the building by removing hot and stale air. 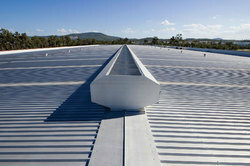 Roofmax ridge ventilators are being best in performance, enduring quality and economically priced. We are offering Industrial Ridge Ventilator to our clients.